I am from Ontario, Canada. The place where I was born is called Mississauga and it is on the shores of Lake Ontario. There is another place in northern Ontario that I have never been to, but hope to visit some day: it is a nation in the Kenora District called Attawapiskat First Nation – it is one of 49 nations comprising the Nishnawbe Aski Nation. It came to national news a few months ago, because of the very high rate of suicides that had occurred and unfortunately keep happening, even at very young ages. I started following the news about Attawapiskat any way I could, and saw that the people there have severe lack in housing, medicare, everyday needs. They did not stop, they have not given up. They have a wonderful Grand Chief, Alvin Fiddler, and their chief is Chief Bruce Shisheesh. Chief Shisheesh met with Prime Minister Justin Trudeau two days ago to discuss the actions to be taken for the community. There is a website called I love Attawapiskat & Canada’s Aboriginal Youth, which shows their various activities and the things they do not only to help their own community, but other communities reeling from suicide and hardship across the whole country! Iain G. Speirs and Josee Lusignan are in charge of the Twitter account and much more for I Love Attawapiskat – they are the founders of this organisation and Josee is also the founder of I Love First Peoples; they work tirelessly, night and day! I am in awe of all that they do. On their website you can see different ways to help. With this post, I hope to help raise awareness about Attawapiskat as much as possible. As an educator, aunt, godmother, Canadian and human, I hope to raise awareness for these amazing people, these brilliant children and their lives. Attawapiskat, I have not met you yet, but I know you are amazing and I send all my love and warmest wishes. And here are some of the amazing young people of Attawapiskat, singing and walking for peace! Note: Thank you so much to Josee and Iain for helping me learn so much and adding lots of details to this post. Another academic year started here in Switzerland a month ago. One of my students that I have been teaching ever since I came here in 2009, came back to classes full of enthusiasm to tell me that next year, he will be going to Canada on a student exchange program! Now my joy is double – he is going to my birth country for the first time, and he is staying there for a whole year! The things he will learn and he experiences of a lifetime he will have! I asked him whether we could incorporate various lessons about Canada into our classes and he agreed. I will be sharing them from time to time on my blog. Today, I introduced him to one of the most inspiring Canadians – Terry Fox. I remember being inspired when I was in Grade 1 in Canada and our teacher was telling us about him. Terry lost his leg to cancer when he was 19 years old, but that didn’t stop him from deciding to run a cross-Canadian marathon when he was 22, with an artificial leg. He did this to raise money for cancer research. He eventually ran 5,373 kilometres, before cancer had spread to his lungs and was the cause of his death. The legacy he has left Canada and the world is tremendous. There is a treasure trove of lesson plans from the Terry Fox Foundation that helped us a lot today and we will be going back to it with my other students as well. 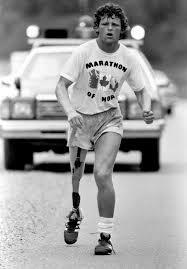 We also watched this inspiring and moving video of Terry Fox’s amazing feat. A Canadian hero that continues to inspire us many years later. I read a really great blog post today that made me think once again about the potentials kids have and how we should encourage them to externalise them and applaud them when they do. 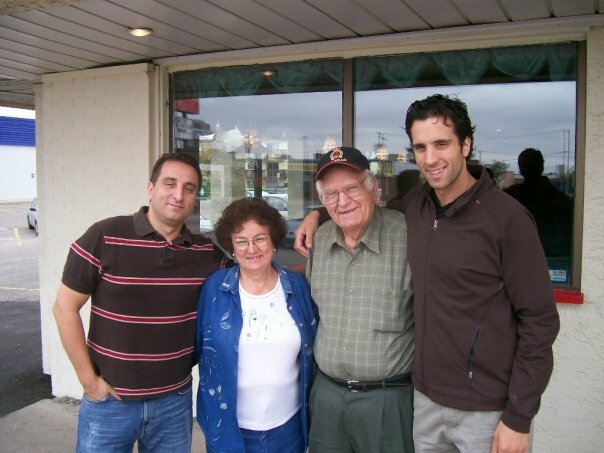 George Couros, a great educator from Canada (and my very first guest blogger!) wrote In Spite of Schools – definitely worth reading. This post pointed me to Shelly Terrell‘s 30 Goals Challenge for 2012 and specifically to Goal Number Four. As educators, apart from the actual teaching we are there for our students, to show them what they can do and highlight their abilities. Sometimes, educators tend to tell their students what they can’t do, where they are not so strong and focus mainly on the problems they may face in their learning. I think it is equally, if not more important, to show them what they are great in and how they can become even greater! When they can do something, they gain confidence and build on their abilities even further. An example that comes to my mind is a student of mine in Greece who wrote poetry – her poetry was beautiful and at the same time she practised her English, as she was learning it as a foreign language! She was developing two talents at the same time, her writing and her language skills. We recognised it early on and she developed it a lot on her own – her autonomy as a learner simply grew from there, as she could find where and how she could learn. You can also see Chuck and Vladka’s Surpr@ise presentation for the Virtual Round Table. I am very happy that a great educator from Canada, George Couros, has written a beautiful post for my blog. George is a principal in a K-6 school in Stony Plain, Alberta, Canada. Thank you so much, George! My name is George and I am a principal. Just writing this statement is almost hilarious, and if you ever talked to any of my former principals, they would probably be pulling their hair out knowing at who is at the source of this statement. The funny thing is, what I thought was once a horrible job, I now know is one that is absolutely amazing. I know that I have the opportunity to not only influence children within my school, but I also have the opportunity to influence the people that have the greatest impact on the lives of these children; their teachers. Teachers absolutely have the biggest impact on the lives of a child, whether it is positive or negative. A child will have the opportunity to either excel in life directly because of a teacher, but sometimes in spite of a teacher. My job is to ensure that I work with my staff to create an environment that does not become the latter. A little about me, I am the baby in a family of 2 brothers and 1 sister who have very powerful and energetic personalities. When I share with people that I am the shy one in the family, I do not know if they are in shock or fear, as I must say I do have a very outgoing personality as well. My parents, both Greek immigrants, are the major influence that I am in the position I am in today. Looking at their impact, it is very different than a traditional route that many educators may have faced. As children in Greece, education was something that was not out of necessity for my parents, but was a luxury that was afforded to only some families. My father was only able to attend grade 2 as a student since he had lived in a country that was torn by political ideologies and was embroiled in a civil war. My mother had far surpassed many women of her generation and actually was able to attend grade 6 before she was pulled out of school. 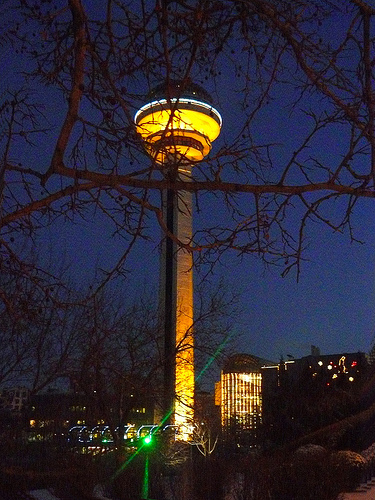 Eventually, they both immigrated to Canada and met in the lovely city of Saskatoon, Saskatchewan, where they married. As I grew up and saw many of my Greek friends persuaded to continue the family business, the importance of education was continuously reinforced by my parents. They did not want us working long hours in a restaurant, and wanted to ensure that, although they loved their jobs, we would be in professions that would afford us a little more time to spend with family. Between my 3 siblings and myself, there are 9 degrees, 2 of which are masters degrees, and one a doctorate by my brother Alec. It was an expectation from our parents that we would all go to university, and they worked extremely hard to ensure that we all had that opportunity. My brother and I both work in the field of education and are extremely passionate about our jobs, and hope that we can inspire a spark in others as well. What my parents do not realize though is that with all of our formal education, they taught my brother and I (along with my siblings outside the world of education) something that was much more beneficial to our profession than any book or Web 2.0 site. They taught us the importance of caring and respect. You see, my parents owned a restaurant in the small town we grew up in that was very popular. When I was younger, it was ALWAYS extremely busy and my parents never seemed to have a quiet moment to themselves. What I had always assumed when I was younger was that because of the quality of food that my parents had made, people continuously would return. As I grew older, I know that this was only part of it. Looking back on how my parents treated every single person as if they were the most important person in the world, was something that I see was unique. My dad would often come out of the kitchen and talk to customers, sit with them, and learn so much about them. My mom, who was the hostess for my entire life, always had something wonderful to say about the people that came in, and I never forget how engaged she was in their stories that they would share about their families. What my parents had created was not only a successful restaurant, but an atmosphere where people felt warm and welcomed. They would continuously come back to visit my parents, not for the food, but because they felt they were a part of the Greek family. Although my mom and dad had worked many long hours, they always treated people with kindness, caring and respect. Eventually my parents sold the restaurant, and although all of the recipes and meals were the same, it quickly closed after they had left the business. This tells me it was more than the food that had lured people to sit in this little Greek restaurant in the middle of Humboldt, Saskatchewan. As a principal now, what do I want to help to create? Do I want a literary factory where students can spew out amazing information, but have no heart or soul? Or do I want a school where people are valued and cared about? Not only students, but staff and parents as well. I know that when you came to see my parents at the restaurant, they didn’t just make you feel like you were the most important person in the world, but you WERE the most important person in their world. There was nothing forged or fake in their treatment of you, they just loved people and they cared about you. If I can help to build an environment where people are happy to see each other, and feel that no matter where they come from, then I will be successful. The funny thing is that my parents have come out to the school and cooked for my staff this year. They are two people that you are forced to hug as you feel that you have known them your whole lives and now you are in their home (no matter where the location is). They welcome you and love you no matter who you are, and how could you not love that back? Before formal education can occur, there has to be a trust that the individual is cared for and appreciated. Building that relationship is the key to the success of all that take part in schools, and I did not learn that from a professor in a classroom in an education class, but from my mom and dad a long time prior. If I could help create the same magically caring environment in my school that my parents did in their little restaurant, I will have been a great success. Vicky’s Note: Shortly after, George started his own blog called The Principal of Change, where he still writes great posts on education. I Don’t Want To Say It, Sir! I was about eight when my family decided to move to Greece from Canada. I remember not taking it very well, but there was nothing I could do about it. When I first saw the school I was going to attend, I saw this old, gray, stone-built construction. “This is your new school!” my mom said enthusiastically. I thought it was an old church the way it looked. So school started and apart from the occasional teasing I got from classmates about my broken Greek accent (which has been rectified now, even though some friends of mine say that there still are English sounds in my Greek! ), I liked school. I remember having a wonderful teacher, a very open-minded gentleman who taught us not only to the subjects but also values which would accompany us later as well. When there were national days, our school (and all Greek schools) organized celebrations during which students recited poems, performed skits which were about the respective historical event that had happened on that day in the past and some teachers made long-winded speeches about how the Greeks had resisted any invaders and come out unscathed through the centuries. So, the 25th of March which is a national day in Greece arrived. Our class was to stage a performance of the women of the period who had helped that day. My teacher thought it would be a good idea for me to have the starring role in the play, as he thought it would also give me confidence in my spoken Greek. So the teacher gave us our scripts. Reading through it the first time at home, I found something very disturbing. I did not tell my parents but decided to directly tell the teacher. There was a line in my script which I thought (and was really) quite offensive to Turkish people (and in a children’s play!). I remember it to this day and it is not worth remembering, or mentioning, for that matter. I went home crying after that (scaring the daylights out of my mom who thought who knows what happened at school). After my parents coaxed me into telling them what had happened, I finally told them: “I don’t want to go back to that school again.” They were still asking me why, because I was not telling them. 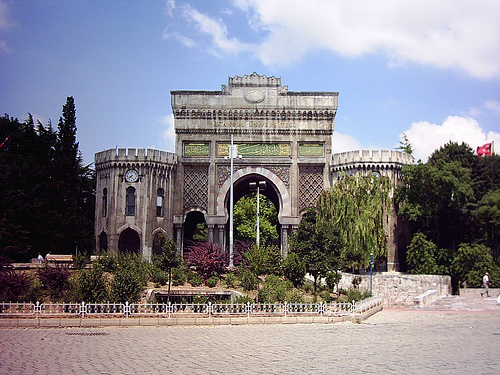 Finally I blurted out: “Because they are making fun of the Turks at that school!” (It took them a lot of persuasion to get me to go back the next day, telling me not to worry and always to remember that everyone is equal no matter where they are from.) Next day: rehearsal number two. The time of the dreaded line arrives again and this time I break into tears in front of everyone and I remember raising my hand and saying: “I don’t want to say it!” (This time certain that my teacher would be furious with me and tell me to leave the school play. But I was determined not to let this pass – a tough little eight-year-old!). My (very patient and kind) teacher took me aside again and told me he would leave out that line altogether and I would just say the rest. My first little victory against negative comments against other countries! Thankfully incidents like this have disappeared from schools today. Or so I hope. I see this now in my teaching. No child is too young to grasp notions like this. Kids understand and they know what is fair and unfair. For this reason, to all teachers, please do not hesitate talking to children about issues of multiculturalism and racism and diversity and so on. Please do not think that they might not understand. Their minds are fresh to accept new ideas and to understand that people are different and it is okay to be different. They will both accept other people and will feel more comfortable about who they are at the same time. The classroom is a place where this can be implemented but first of all children’s primary education must be based on these humanitarian notions. It is the best kind of education they can get. Note: When I wrote this post, I was not out to criticise the specific system, as I think that unfortunately in many educational systems in the world notions like these are perpetuated. It is just an example of such notions. My teacher demonstrated that he chose not to do so. We can all do the same and show our students the beauty of being different – the beauty of all cultures.